That gently-used item by Paul or Patti Smith you picked up at a Housing Works thrift store? You may have bought it knowing that proceeds support outreach to homeless individuals and families living with HIV/AIDS — a task Housing Works has performed tirelessly since emerging out of ACT UP in 1990 — but have you thought about how Housing Works translates your dollars into services for these populations, or what these services actually are? The fact that housing is central to Housing Works is obvious: the name of the organization is a statement of ideology. But this fundamental mission is often overshadowed by their street-level enterprises, the used bookstore and thrift shops that are the most visible part of the organization’s brand. That’s why we created Living Room: Housing Works Builds Housing, an exhibition that surveys the supportive housing programs and developments built by Housing Works in New York City between 1990 and today. On display at the Metropolitan Pavilion (from April 26th to 28th) as part of the nonprofit organization’s annual Design on a Dime fundraiser, the exhibit chronicles a fascinating story of activism, advocacy and perseverance that has yielded 170 units to date, in the face of governmental roadblocks or indifference to people in crisis. “Housing is never just about housing,” my co-curator, Karen Kubey, continually reminds me. And when it comes to supportive housing for a specific community in need, the design and management of service delivery becomes especially crucial to a real estate development project’s success: Housing Works operates day clinics in the West Village, the East Village and East New York that provide medical and dental care, legal aid, harm reduction and counseling. Their job training program offers transferable skills in everything from business skills to catering to property management, and many graduates from this program subsequently transition into staff members at one of the entrepreneurial ventures that help fund the organization. “Housing” in Living Room: Housing Works Builds Housing is about more than bricks and mortar containers, and “building” evokes more than construction alone. Our exhibition draws attention to scattered-site housing programs and ground-up housing projects alike and the services that wrap around them to move people off the streets and achieve health and stability. Before breaking ground on their first ground-up development, the Keith D. Cylar House Health on East 9th Street and Avenue D, Housing Works would lease apartments from private landlords for their clients. Throughout, their approach has been about preparing people for life. These aren’t just rooms for not-dying; they’re living rooms. To conceptualize and create the exhibit, Karen and I approached architect and exhibition designer Greta Hansen, producer Daniel Quinn, and graphic designers Juan Astasio, Glen Cummings, Aliza Dzik and Jenna Kaminsky of MTWTF, a firm that has created innovative books, exhibitions, and educational and visual aids to engage the public on housing issues. Diana Boric, Silas Munro and Daniel Fleishman from the marketing, design and housing development teams at Housing Works offered unique insights into the organization’s history and present-day challenges. The resulting collaboration has two parts: a multifaceted, 28 foot-long timeline that situates Housing Works within histories of HIV/AIDS and the supportive housing movement; and a full-scale representation of an actual Housing Works unit. 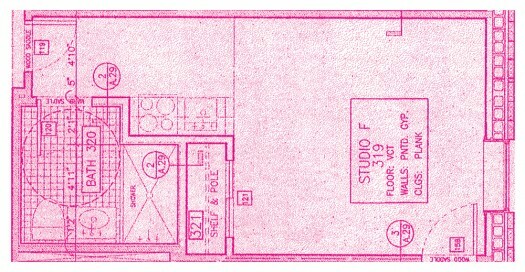 The floor of this 300 square-foot space is an archival plan of an apartment in the Keith D. Cylar House Health Center that we tinted pink, blew up and printed on vinyl. We used wood and rope to extrude the walls, ceiling, door and window into a three-dimensionalized blueprint drawing — a 1:1 mock-up that ties Living Room to a specific moment in time. My collaborator Greta Hansen suggests that “the installation is a way of bringing a housing unit from the East Village of the 1990s back onto our mental map.” It’s a place where Housing Works “realized a symbiotic relationship between housing, medical care and social services.” In addition, to understand scale and orientation, visitors who step onto the plan/floor will notice design features that distinguish it from the single room occupancy (SRO) model that preceded it — the cheap, flexible and sometimes-exploitative or substandard accommodation once popular with populations at risk of homelessness (until they were abolished in the 1980s). In contrast to typical SRO accommodation, the unit includes a private bathroom and kitchen, and comes furnished with a suite of daily essentials like towels, pots and pans, a laundry bag, sheets, as well as the sink and chair that Hansen represented with three-dimensional CAD drawings. The room we have constructed is a metonym for Housing Works, and the timeline positions the physical structure within its political and social contexts. MTWTF graphic designer Jenna Kaminsky looked to the artist collective Group Material’s 1990 mixed-media installation The AIDS Timeline as a reference and inspiration. This collage of images, text and data that wrapped around an entire room was an attempt to take stock of devastating loss nine years into the epidemic — yet only three years after President Ronald Reagan finally uttered the word “AIDS” in public. “I found the way [Group Material] untangled the story of AIDS to be really intriguing, particularly the visual impact of the entire room in contrast with the more detailed moments on the walls,” Kaminsky notes. MTWTF’s beautifully designed timeline expresses how Housing Works’ has navigated a biopolitical alphabet soup of agency acronyms to emerge as part of the supportive housing movement. Alongside this new politics of care forged by nonprofit organizations, the timeline presents data collected by the New York City Department of Health and Mental Hygiene that charts the definition of sickness and health over time. These deceptively low diagnosis numbers, based on the Centers for Disease Control and Prevention’s shifting definition of AIDS, are key to the story: Housing Works’ early-’90s scattered-site Independent Living Program filled in the structural gaps in who received aid by housing clients who were diagnosed with HIV, but not AIDS — the sick but not sick-enough who were shuttered from the system. Elsewhere, new programs and developments by Housing Works appear alongside key Federal, State, and City legislative moments, and visitors connect the dots. For example: the 1993 case Mixon v. Grinker, which required housing with “minimum standards of safety and decency” for individuals with HIV/AIDS and therefore set a precedent for bypassing the shelter system. Housing Works’ 1995 Tuberculosis Scattered-Site Housing Program, which established formal linkages with Bellevue and St. Vincent’s Hospitals to release patients with TB and HIV/AIDS into supportive housing units versus health-compromising congregate shelters. And the 2001 founding of the Women’s Transitional Housing Program (WTHP), a scattered-site program for single women living with HIV/AIDS who have been released from the correctional system within the previous 24 hours, and the 2009 opening of a 6,720 square-foot townhouse in Bedford-Stuyvesant with 20 units for these women. “The timeline asks you to actively participate in the construction of the story,” explains MTWTF Partner Glen Cummings. Living Room: Housing Works Builds Housing asks Housing Works supporters to consider how key moments in health, legislation and grassroots organization coalesced into the architectural drawing beneath their feet. Thanks to Housing Works, that drawing represents someone’s home.